Chameleon diamonds are arguably the most riveting of all fancy colored diamonds for their distinctive ability to change color. Chameleon diamonds undergo a short-lived change in color when subjected to one of two particular environmental stimuli: (1) a temperature that reaches 140 degrees C or (2) an extended period of being kept in a dark place. Chameleon diamonds whose color change is dependent on temperature are "thermochromic" while those that are sensitive to a total absence of light are "photochromic." 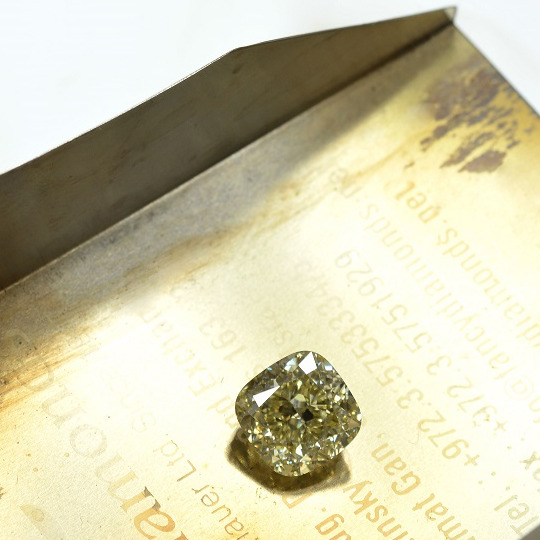 This mutable species of natural colored diamond are some of the rarest diamonds on earth and are therefore highly valuable. Diamonds are a natural beauty that people have cherished throughout the history of mankind. These precious stones have always been held on such a high level because of the outstanding beauty that they reveal. Step 1 - The Diamond Is Cold. Step 2 - The Diamond Is Getting Warmer. Step 3 - Diamond Is Getting Even Warmer, Color Change Is Very Obvious. Step 4 - The Diamond Is Orange! Chameleon diamonds generally change from a stable color of olive green (greyish yellowish green to greyish greenish yellow) to an unstable color of more intense brownish or orangy yellow to yellow. Some chameleon diamonds are a light yellow color that transform into a more intense greenish yellow. Exposure to heat tends to yield a more marked change in color than a lengthy time spent in the dark. Some chameleon diamonds exhibit a stable green color similar to conventional natural fancy green diamonds. While we know that conventional green diamonds derive their color from radiation, whether natural or laboratory-induced, it is not yet definitively clear, however, what gives chameleon diamonds their color. A hydrogen-related defect appears to be the main cause, but has yet to be confirmed. The behavior observed by chameleon diamonds is entirely natural, any lab-rendered or lab-enhanced parallel is simply impossible. To determine whether a diamond is indeed a color changing diamond, it is best to submit the diamond to a gemstone grading lab, such as the Gemological Institute of America (GIA), for testing. Labs will be able to decisively conclude whether a diamond is a chameleon and they will have the tools to run the required tests. The further along this spectrum you go, the richer and more intense the color is to be seen in the diamond. Chameleon diamonds routinely have low saturation and a medium lightness of color although some certainly fall on the Very Light or Fancy Dark part of the spectrum. Tone refers to the lightness or darkness of a chameleon diamond, and the continuum in between. GIA grading does not make a distinction in tones, but to the eye a stone with darker tones may appear more intense in color. It is normal for all chameleon diamonds to display fluorescence. 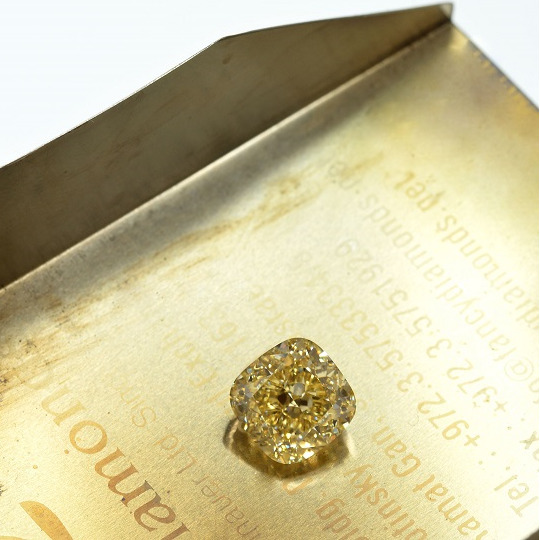 Chameleon diamonds characteristically exhibit a medium to strong yellow fluorescence. In the final analysis, the enhancement to a stone's aesthetics that fluorescence offers is entirely subjective. Chameleon diamonds generally range from VS1 to I1. Clarity is of secondary importance in chameleon diamonds because chameleons, like other natural fancy colored diamonds, are prized first and foremost for their color, particularly a main body color that is green. Chameleon diamonds can be found in virtually all shapes, including pear, radiant, cushion, heart, oval, emerald, marquise and the classic round brilliant cut. In the case of chameleon diamonds, a round brilliant cut does not necessarily desaturate color as they usually have darker tones than other colored diamonds. Take note of uneven color distributions as well (these will be noted on your GIA certificate), as they can certainly affect a diamond's appearance and value. Although chameleon diamonds are some of the rarest diamonds to exist, they tend to be more affordably priced compared to other diamonds of the rarest degree, such as fancy pinks and blues. The value of a chameleon diamond will depend on several factors, including its main body color (green is generally the most desired); intensity of body color (Fancy Deep or Fancy Dark are most desired); carat weight (the larger, the more valuable the chameleon diamond, and the more obvious the chameleon effect will be); clarity; and intensity of color change. Less common shapes among chameleon diamonds, such as the emerald cut, can have a profound impact on value as well. In general, a color diamond is rare when it exists as one color without any modifying colors. Chameleon diamonds are typically green or yellow diamonds that have secondary colors of grey, yellow (if the main color is green), green (if the main color is yellow) and/or brown. Color is a fascinating trait that every diamond possesses. The color of a diamond never changes regardless of the temperature or storage environment. Color, which is the most important characteristic of fancy colored diamonds, will always appear just as strong as it did on the original day the diamond was polished. Needless to say, when people began noticing that certain diamond colors would change depending on the environment, this caused a pretty big stir in the industry. Classic Chameleon colored diamonds possesses two very distinct natural capabilities. Thermochromic and photochromic behavior patterns. Its thermochromic behavior enables the stone to temporarily change to a darker color when heated from 15 degree Celsius to 25 degree Celsius, for a short period of time. As the stone cools off, its color gradually changes back to the lighter original color. Its photochromic behavior enables the stone to temporarily change to a darker color when stored in a dark place for a longer period of time. When the stone is exposed to light, the lighter color is gradually restored. There are a number of diamond characteristics that are common with all chameleon colored diamonds. Chameleon diamonds do not appear in all color intensities. For example, they cannot be found with vivid and intense colors. Chameleon diamonds always possesses diamond fluorescence and they will always include some sort of color combination. The combinations always include any of the following colors: green, yellow, brown, and gray. This phenomenon cannot be found in pure colored diamonds and most often contains at least two overtone colors. However, there a number of stones that contains only one secondary hue, for example the 8.04 carat fancy dark grey- green chameleon diamond discussed earlier in this article. Depending on whether the stones are 'Classic' or 'Reverse,' the dominant color can be any of the four colors mentioned. Some of the more common overtone combinations are Brownish-Yellowish, Gray-Yellowish, Grayish-Yellowish, Gray-Greenish, Brownish-Greenish, and Green-Yellow. Still, similar to all fancy colored diamonds, no two stones are exactly alike and many other color combinations will be found. Chameleon diamonds have been classified as a natural color of their own. Their behavior cannot be replicated and there is no known treatment to cause the chameleon affect on other stones. Chameleon Color Change Through The Heating Process. The color of a diamond is created by the compound elements absorbed into the composition throughout its creation. Through the study of spectroscopy the various elements present in the composite of the diamond are defined. Even today, there is no known constant definition of elements present in Chameleon colored diamonds. Obviously, the large the diamond is the easier it will be identify the difference in color variations. However, since these stones are so rare, finding a large Chameleon is not such an easy task. As a result of the rarity, Chameleon colored diamonds are extremely sought after fancy colored diamonds and are often sold for quite a hefty price. One of the most well known, absolute basic diamond characteristics is the fact that a diamond's color will never change. Chameleon diamonds are the only ones that have the ability to temporarily change their natural color. The year 1943 was the first time the phenomenon of Chameleon colored diamonds was officially recorded. Peter Kaplan, of Peter K. Kaplan Inc., noted that the color of a diamond seemed to have change to a darker color while on a very hot polishing wheel. 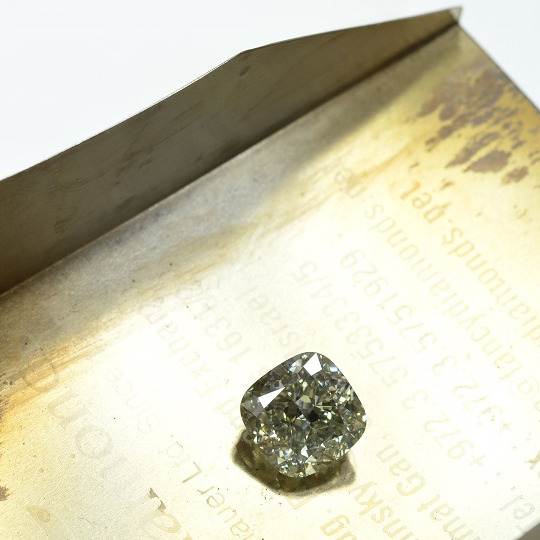 The story goes that the diamond was confirmed a light yellow-green stone. The owner noticed the light yellow-green stone she had purchased turn to a dark green color after having been stored in a jewellery box for some time. She went to return the stone for its peculiar behavior, not knowing at the time that she had possessed a highly valuable diamond that was most likely worth a lot more than she had purchased it for. Since that time, many diamond specialists have studied the miraculous phenomenon. Only, to this day, there is no documented cause to the affect. There have been a number of theories recorded, but none with enough science to prove the fact. In 2007, the world's largest Chameleon diamond was purchased by Chopard, a Swiss based luxury watch, jewellery, and accessories company. 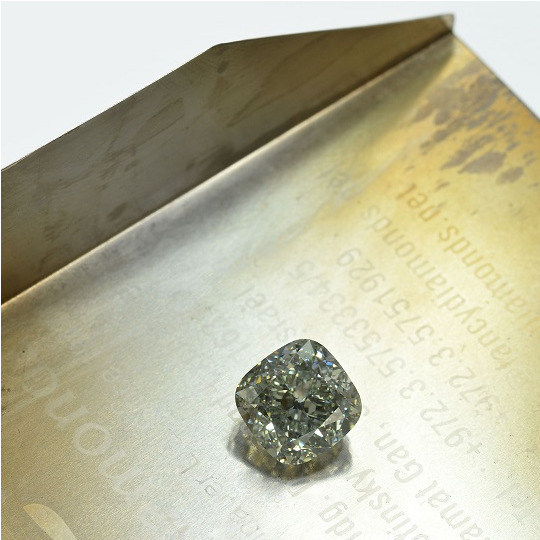 The diamond's carat weight was an astonishing 31.31 carats. Another famous piece was the 8.04 carat fancy dark grey-green Chameleon colored diamond. The piece was surrounded by pink diamonds in a pave setting and set in an 18 karat rose gold ring. Due to the size and rarity of this piece, the ring was purchased for $2,100,000. In May, 2001, a superb fancy dark gray-yellowish green chameleon diamond ring was sold at Christie's Hong Kong auction for approximately $240,000. The stone was a 4.41 carat cut-cornered, triangular-cut stone set on a platinum mount. Chameleon diamonds are such intriguing stones because of the 'unknown' capabilities that these jewels posses.